Kevin Lyons began his career at Rutgers University in 1988 as director of procurement working on numerous projects and proposals relating to green purchasing and improving contracts, transforming the way the university did its daily business, from lighting and energy management to waste recycling and contract packaging. Early in his career at Rutgers, he successfully took on a multi-year initiative to improve the university’s efficiency and effectiveness while incorporating environmental values. His concern in purchasing has been to consider the ethical implications: Where do products come from? What impact are they having on the university? Is the school buying local? Is it engaging the local community in the struggle to bring change? 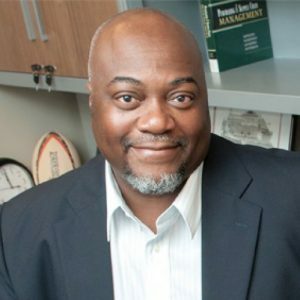 He is currently Associate Professor of Professional Practice at Rutgers Business School, Newark and New Brunswick, where he conducts research on developing and integrating global environmental, social, economic, and ethical criteria and data into supply chain/procurement systems and processes. He also serves as director of the Rutgers Business School Public Private Community Partnership Program. Lyons has created the supply-chain archeology and supply-chain waste archeology research disciplines and has written extensively on conducting environmental health checks on global supply chains and the resulting benefits of reduced risk-management impacts and costs. He is the recipient of the National Wildlife Federation’s Conservation Achievement Award and the Sierra Club Annual Professional of the Year Award as well as the New Jersey Department of Environmental Protection Annual State Recycling Award and the New Jersey State Governor’s Award for Environmental Leadership and Excellence. His book Buying for the Future: Contract Management and the Environmental Challenge (2000) is a guide for institutions and businesses that take seriously the goal of living appropriately on earth and of educating their members in the associated values. Kevin Lyons received his doctorate in environmental management and operations at the University of Sunderland in the UK.